If you are an R2 Builder and would like to become more involved with Endor Base events, we welcome you to register for our forums! Once you have a Rebel Legion forum account, you can get in touch with our Base CO (Draeden Wren (Donald Wicks)) or XO (Lebo1138 (Jason Leibowitz)) verifying you have a completed R2 unit. Once they are able to verify you have a working/completed R2 they can post a request in this thread to grant you access to our Legion and Base events forums. 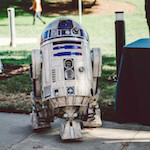 (It would help to post a photo or two of yourself with your completed R2 in the thread when requesting addition to our Driod/R2 group). Thanks, I'll work on updating them. A lot of links broke when our forums moved this year. nice.. do I get TOD for doing events with my R2 too? That would be up to our current BCO. The way I see it, if you sign up due to a request for an R2 through RL, or are there working with RL in some way, I feel it should count. It's participation. I requested Access as R2 Builder. I am informally signed up for the RMH event coming up next month.